As the doors open the Reaper turns his back. The last thing he hears before he exists the alley is the sound of the door slamming shut. What's up guys? Thanks for dropping by. Let me tell you about a little idea of mine. 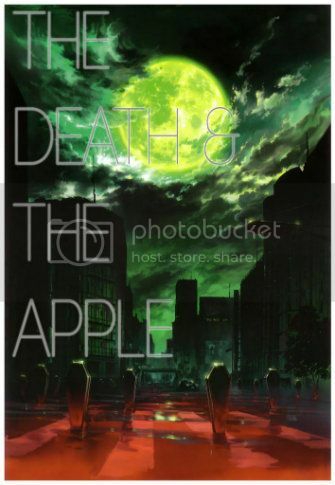 The Death & The Apple is an open world style, supernatural roleplay based in Babylon city. Babylon is a paralel version of New York, it's a city that's been the home base of the Reaper order for many, many years. This city is where the bulk of the roleplay will take place, it's a huge city, filled with plenty of hidden nooks and crannies for our characters to explore. Over the course of the story, other locations will also be explored, these are the utopian society of Heaven, and the tribal wastelands of Hell. I'll update this thread at a later date should people show interest, with more info on those two areas. Reapers are guardians of humanity. Extraordinary humans gifted with supernatural abilities. Theirs is an ancient order, created back in biblical days during the Great War; a seven year battle between angels and demons. At the climax of the Great War, it was the Reapers that brought the two sides to a truce. The truce holds true today through a shaky peace between Heaven and Hell. The main goal of the order is to keep mankind free from the entanglements of the supernatural world no matter what. A Reaper's day to day duties normally consist of hunting down those whose time has come. Using their silver crucifix pendants they 'send' people to the afterlife, weather it be Heaven or Hell. It's imperative for a Reaper to send a soul, why? Because, should a soul not be properly sent it becomes Lost. Lost Souls go one of two ways. The first is that they are doomed to linger in limbo: a plane between life and death. Souls in limbo are the ghosts we see. The second route for a Lost soul to go is much more horrible. The Lost Soul gets warped through the intense negative emotions it holds, becoming something similar to a demon. Reapers must combat these abominations and stop them before they harm the living. Upon entering the order, a Reaper is paired with a senior member and they are immediately trained to unlock their Psyche. Psyches are the true power of Reapers. A single ability that grows and evolves with the user. No two Psyches are alike. The Reaper order is lead by none other than The Grim Reaper. He is a man chosen by the leader of the angels and a collective tribune of Hell's tribal chiefs. The current Grim Reaper is a man named Alan Darkmare, and fate should have it that he is also the mayor of Babylon. The thing is though, The Grim Reaper is dying. Bedridden for the past six months, the supernatural world is reeling, and many fear that it may be time for a new Grim Reaper to be chosen. The roleplay opens up during an unstable time in Babylon and the supernatural world. The Grim Reaper is on his death bed, more and more Lost are appearing in the Living Plane, and tensions between the forces of Heaven and Hell are at an all time high. Your character gets swept up in all of this. You are a human, whether you're a member of the Reapers or not doesn't matter, one way or another, you get swept up in all of this. I'm not allowing members to play angels or demons because I want to keep them seen as these otherworldly figures. They're beyond or means and something we can't fully understand. As the story goes on there will be several angel and demon NPCs that I might allow some people to double up as, but never as a main character. So that's the skinny on this thing. Would anyone be up for this? OH MY GOD IM INTERESTED LIKE A MUG. EVERYONE NEEDS TO READ AND JOIN AND KEEP THIS ISH ALIVE. Obviously, you have my attention. If this goes through, you can count me in. Count me in and more info plz! Awesome, awesome. Nice to see people interested in this! The roleplay is for the most part complete, I'm just gauging interest before I start really. I think I'll launch this bad boy on Sunday. Seems like a good starting point. Heres some more info on Hell. The second of the three maps in the story. Hell is this post-apocalyptic looking location who's mangled architecture can be traced to a number of different time periods. Ranging from Great War, Biblical Period monuments, to fallen skyscrapers, no one is actually certain the reasoning behind the area's strange appearance. One thing is certain about Hell though, and that's it's enormous size. The plane easily dwarfs Heaven, with most of it being completely uncharted by the Reaper order. Not much is known about Hell other than what the chiefs allow to be known. What the Reapers do know is that Hell is run by 23 tribes of demons, all vying for control of the wasteland. Law of the land varies based on who's territory you're currently in. The Morning Star, Lucifer was said to be the leader of Hell before the tribes appeared, what led to his ousting from power is still unknown by the Order. It should be noted that the Reaper's aren't necessarily popular in the eyes of the demons. A lot of the denizens of Hell see the Reapers as elitist scum, and only recognize them because the chiefs are forced to by the Great War Treaty. I'd have to say I'm interested as well. I'm a new member and I can't guarantee I'll be able to join, but I will certainly be monitoring this idea's progress. I'm amazed this is getting such good feedback! Alright, today is the day I'll make the roleplay, look out for it everyone. Holy crap, I'm so in. I haven't roleplayed in a while and I've been waiting for a good RP to come about. This, my friends, is that roleplay. I think i'd be into this. It seems pretty freaking interesting imo. Soooo, you guys have any idea how long it takes for mods to approve new threads? I posted the roleplay but I'm still waiting for it to go through. Does it normally take a little while for things to go through? Eh? Mods don't have to approve your RP threads. o_o really? Because I got a message saying that a mod needed to approve my thread before it went through. Maybe it's some kind of thing for new members? The threads up! Let's do this thing.